I'm working on a site that needs to have the ability to search News (within the portal) and the entire web. This is an option that my colleague came up with. It doesn't seem right to have two buttons that initiate a search. I've seen radio buttons as an alternative, but does anyone have a better option? Two of most common search patterns can do the job. How about having two radio buttons and a command button ? If you can afford it computationally, search on both and let the user decide after they've looked at the documents which ones are useful. You can rank everything together & let the user scroll through it, and you can add faceted filtering for those who know what they want to see. Keep the task simple. 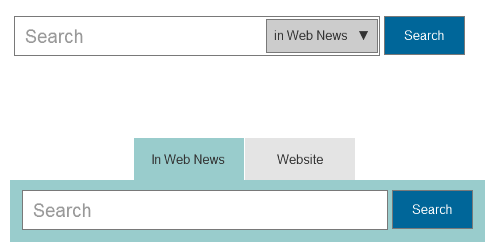 Main activity is searching the news, so the bar should only have the 'Search' button and a proper label 'Search News'. Search the web is an additional functionality, use a checkbox to allow the user to enable or not-enable the functionality. You can have a larger textbox which is prominent on the display area of your page, which will search the content inside your web pages/system. Then you may use a search box on the top right corner which will be used to search the contents on Google. Another option you may think of is using a drop down, which in case may not be that convenient or user friendly. First, there is confusing button label Search News. How could user guess that News means portal search? Even on screenshots in answers you can see label In Web News. Second, your option with two buttons is good enough. At least, it is clear for user where to perform search (after correcting label Search News). Third, if task analysis and/or web server logs show you primary search source (i.e. 70% refer to Web), than you could do radio buttons with smart default, as was shown earlier. Although your example is not a common pattern or convention, it is perfectly clear and concise (the radio button and drop down list alternatives are not as concise and require more work, both cognitively work and mouse-clicking). I don't see any better alternative to your example. Not the answer you're looking for? Browse other questions tagged buttons design-patterns search or ask your own question. Should an empty search box return an error message or all results? How should multiple buttons wrap on different responsive breakpoints?